Summer hasn’t exactly made an appearance here in Korea, but cats’ eye rims and iridescent lenses… I’m seeing them everywhere. Everywhere. And now I have a distinct need for a pair of my own. In both styles. Not sure if I want to go for the combination yet, but I can see it happening – soon. My uber-wants for both styles come from styleNanda. (sigh.) On the mirrored lenses front it’s the affectionately named ‘point item sunglass‘ priced at 17900w / £11. The next time I’m in styleNanda I am buying these. I am. For Cat Eye’s, it’s a toss up between the Anglo-2 in black by Spitfire and Fleur Green by Quay. Neither of them are particularly winged or flicked at the tip like a lot of the more dramatic pairs in this style, but the subtle flick I think suits me more. Unfortunately, at nearly £30 for each (48000w and 52000w respectively), I don’t think I’ll be running to purchase them any time soon. So I’ve had to do some searching for a couple of Cat Eye alternatives. 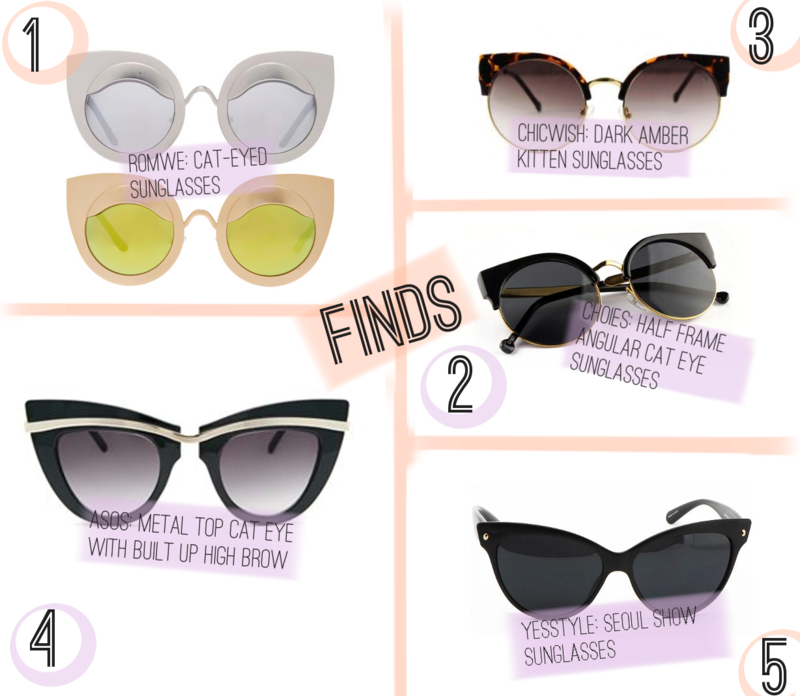 Starting with my favourite alternative: the Romwe Cat-eyed sunglasses that come in either dark silver or gold. Priced at £9.33 (free shipping worldwide) it’s probably a good thing these are out of stock right now, otherwise I’d’ve snapped them up. They’re probably not to everyones tastes, seeing as the rims are quite large, and they’re definitely not as subtle as the styleNanda offerings up top, but there’s something about the brashness that I really quite love. 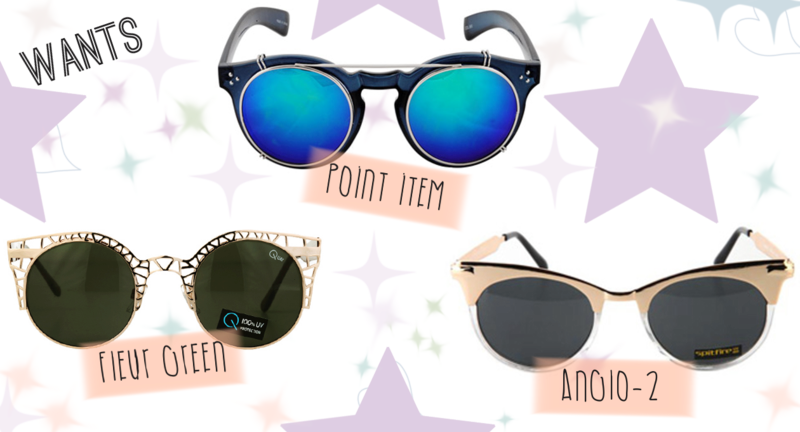 Scaling down from cat to kitten, and slightly pricier at £12.59, are the half-frame angular cat eye sunglasses from Choies. Despite the fact they look quite understated, they cover quite a decent amount of face to add that smidge of drama that the glasses with bigger frames automatically have. I have a real thing for half-frame glasses at the minute it seems, seeing as the next pair are the dark amber kitten cat eye sunglasses from chicwish. They’re currently £12.66 in the sale, and the size of the glasses is a little on the smaller side of this selection. I think they’d add a cute touch to any spring or summer outfit, and not too dramatic so they wouldn’t detract from other statement pieces. From understated cute to dramatic flare, the Asos metal top cat eye sunglasses with built up highbrow will certainly get people talking – and not because the name is quite a mouthful. Part of the reason I like these so much is because the ‘metal top’ is continued across the glasses to become the arms, which is a really fluid stylistic touch. They retail at £12. Toning down all drama for the understated flare of the black statement glasses is the Seoul Show sunglasses from yesstyle. The simple frames are perfect for anyone who wants to try the cat-eye look without being too dramatic, or for those who think sunglasses really do not suit them. For £15.47, they are the most expensive on the list, and personally I do think they’re overpriced for what they are. I’d expect a tad more bedazzlement or some other stylistic feature to warrant that money, but if simple is what you’re after and you don’t mind the price (well it’s not exactly designer prices but hey), then these are pretty much perfect. So for me, I think I’ll end up getting a pair of the dark silver from Romwe, and maybe the pair from Choies too, if I don’t bite the bullet and cough up for one of the styleNanda offerings. Maybe. Still undecided. I know there are a ton more styles out there, so if you have any favourites I haven’t put here, let me know? If not, out of these styles, which do you like most? "I love Korea in the the Springtime"